Every kid wants to give flowers to their mom, especially on Mother’s Day. 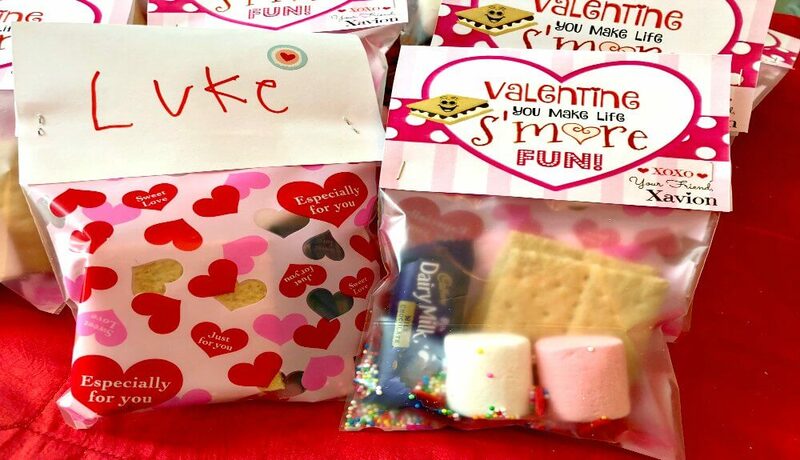 Buying flowers from the store is expensive and little kids don’t have much money to spend. 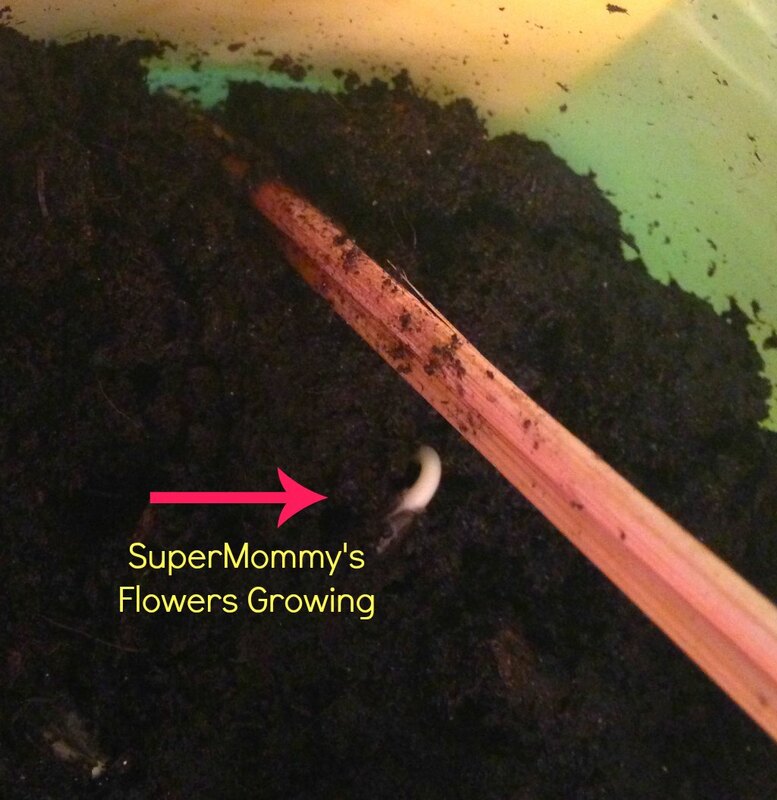 Instead of getting Mom a bouquet of flowers, why not have your child plant some instead? 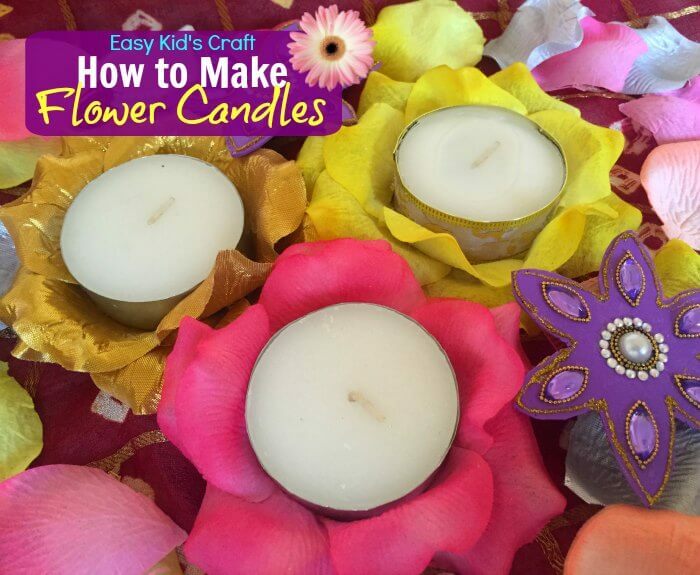 Here is a cheap and easy way for toddlers, preschoolers and elementary school kids to give their mom flowers. 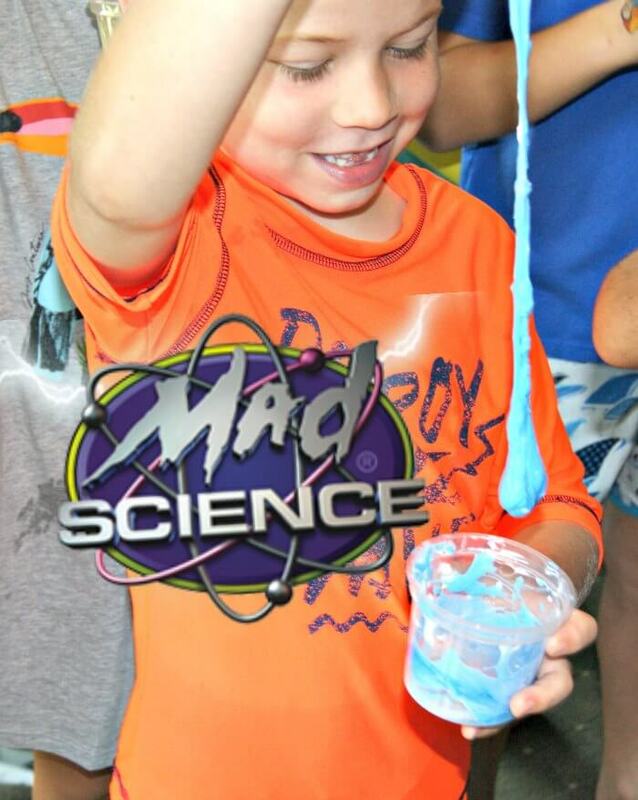 This is not only a fun activity for kids, but they will also learn about “how plants grow” and how to “tend to their flowers” each day. 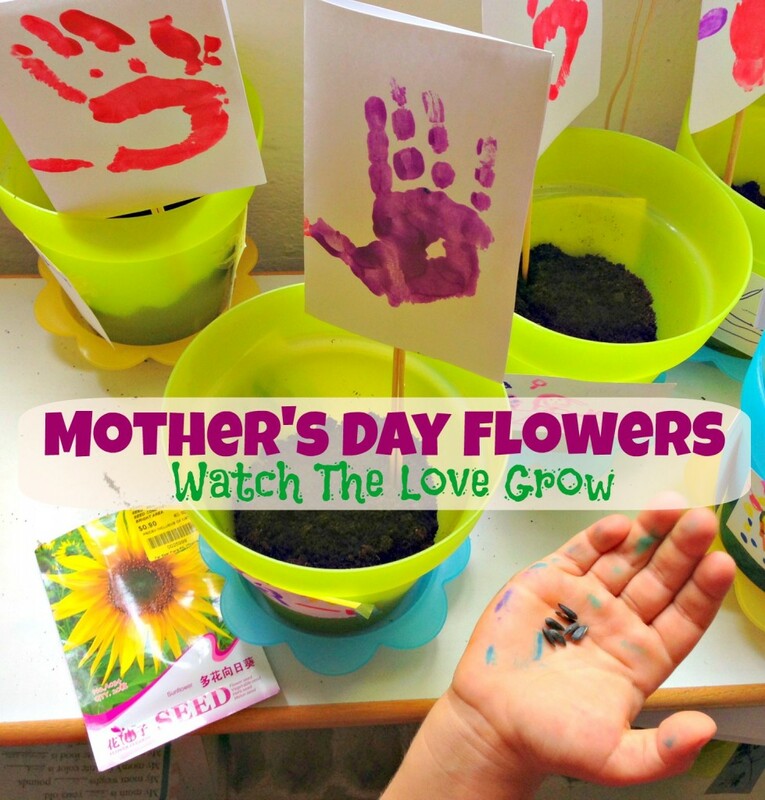 This year for the Mother’s Day class project (3 & 4 year olds) we came up with the idea of “Flowers for Mom”. 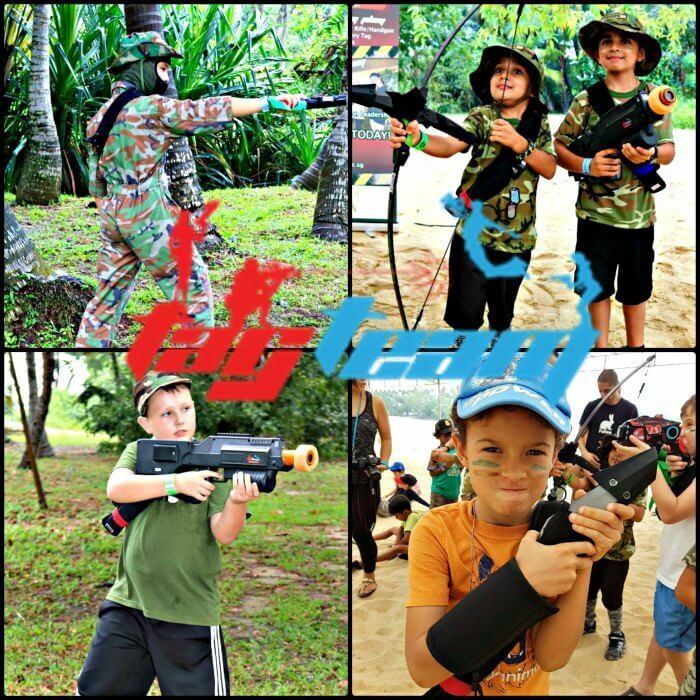 This was a parent-led activity that was organized by myself and the other class mom. 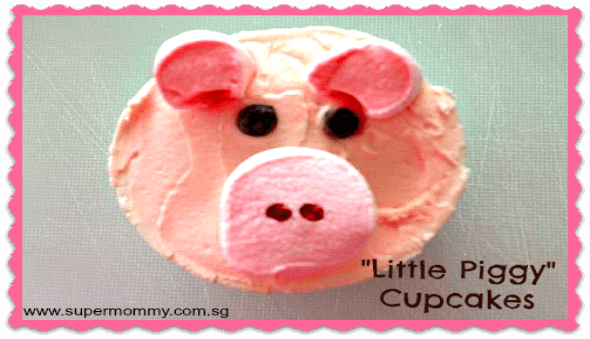 Each flower pot gift for Mom cost less than SG$2.10 (US$1.70) to make. 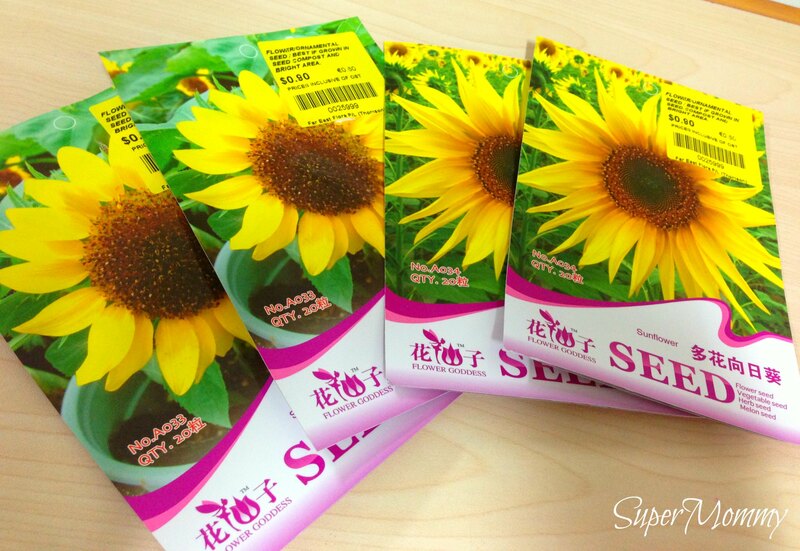 Flower seeds (approx 3-5 for each pot) – (It costs SG$.90 for a pack of 20 seeds from the Nursery). 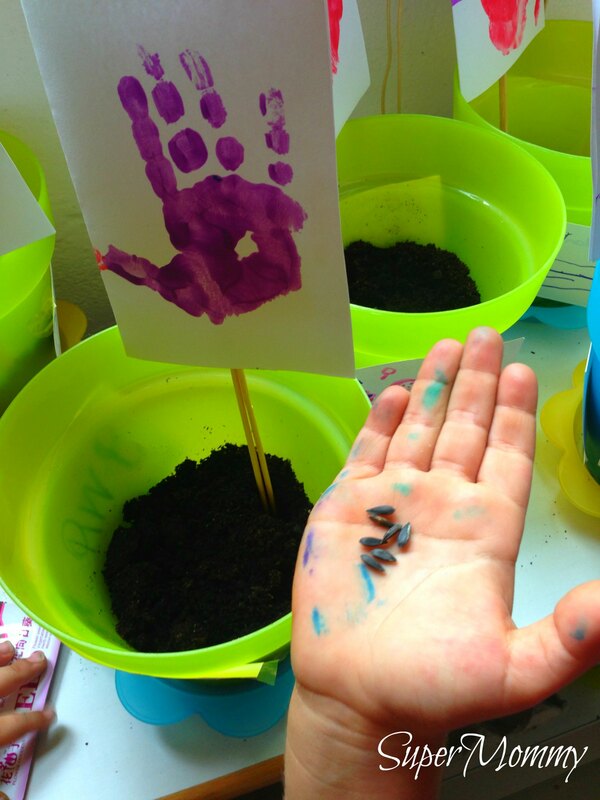 Each kid added soil to the plastic flower pot. Note: The soil provided by the school Gardner. However, you can easily purchase soil at your local nursery and at some DIY shops. 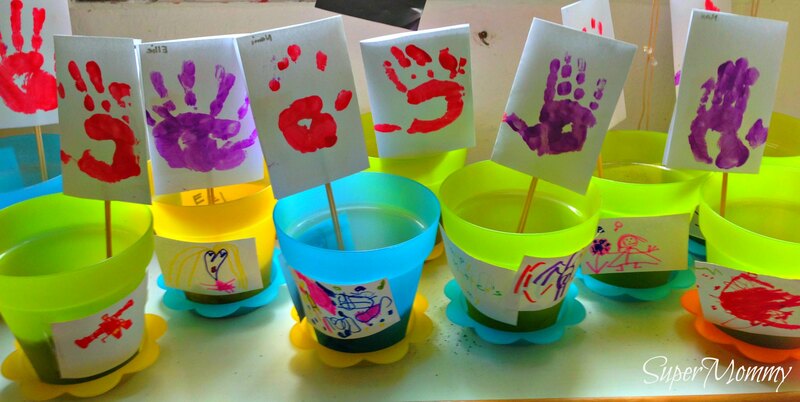 After adding the soil, the kids each decorated their own flower pot. 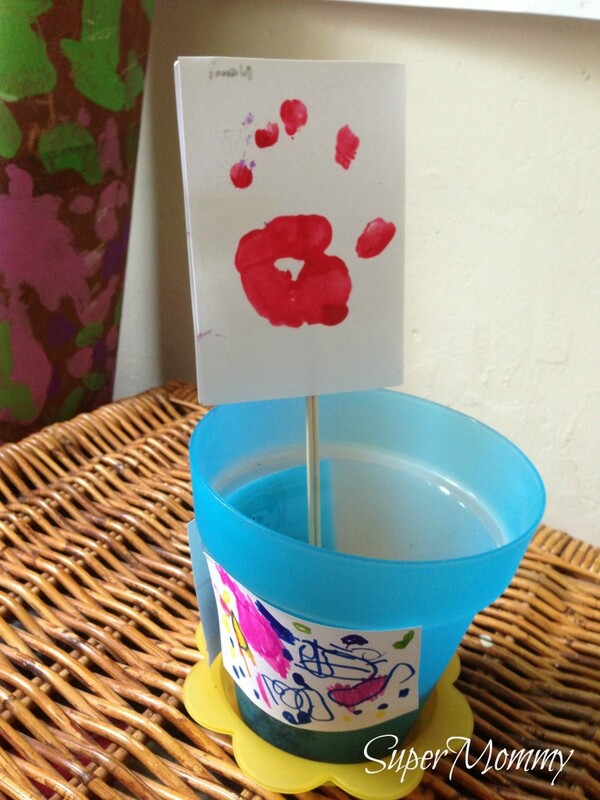 Originally, we planned to paint, glitter and put stickers on the pot, but that would take away from the actual flowers. Thus, since the pots were really cute as is, we decided that we would just keep it simple and use pieces of “artwork” to decorate. 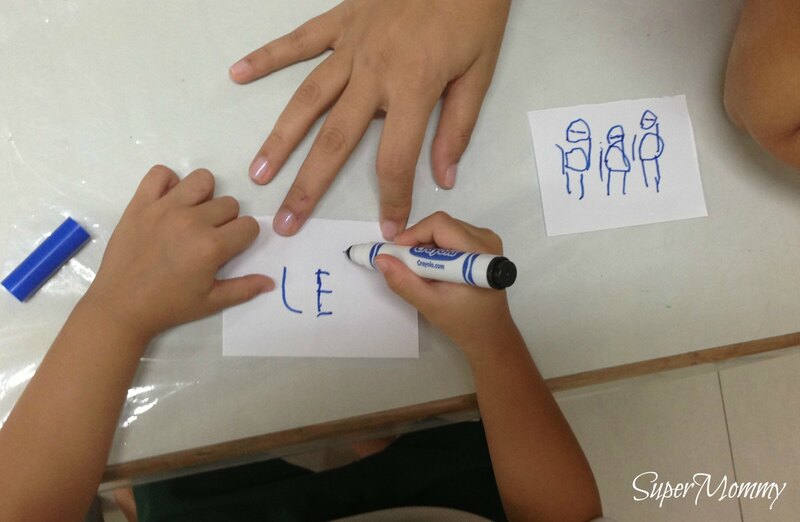 The kids were instructed to write their name, mom’s name or Happy Mother’s Day on the first piece of paper (whatever they could write on their own) and the other piece of paper would be a special drawing for mom. 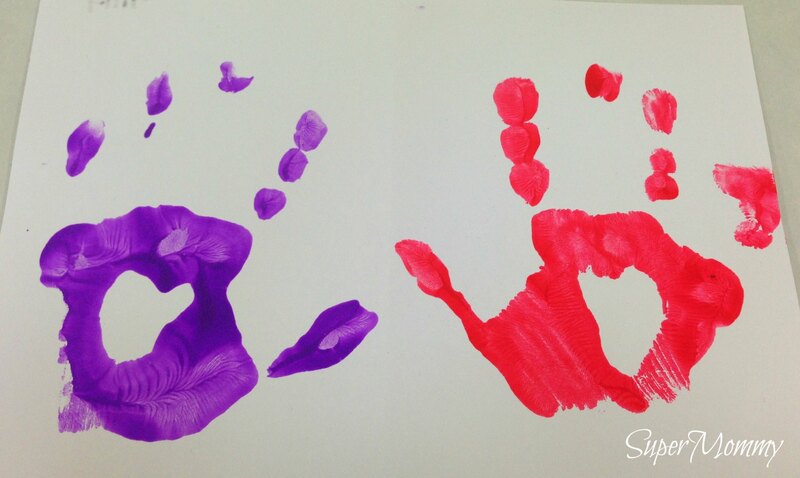 In addition to the artwork, we decided to add some handprints as part of the gift. Kid’s handprints are something you can’t have enough, especially when they are young. 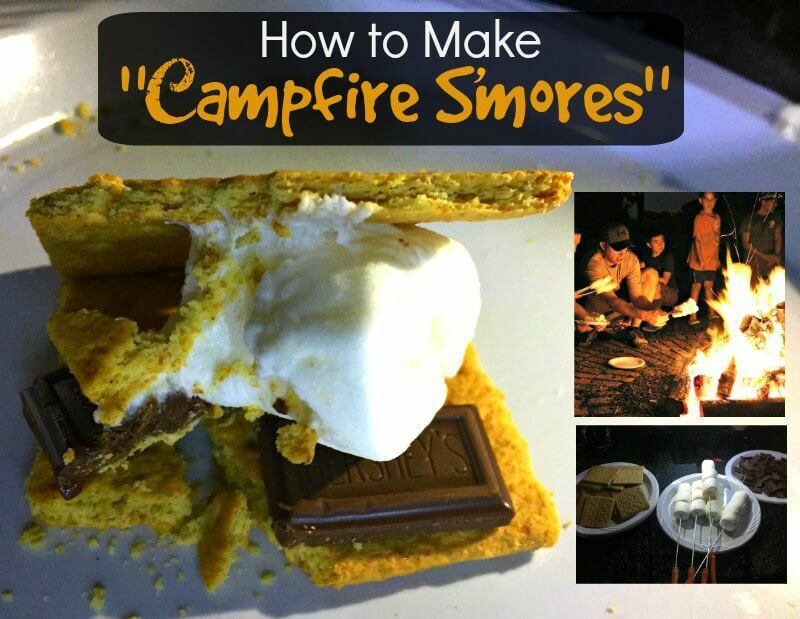 These are a great keepsake item that Moms usually don’t throw out. All you need is paint, paper (and hands). 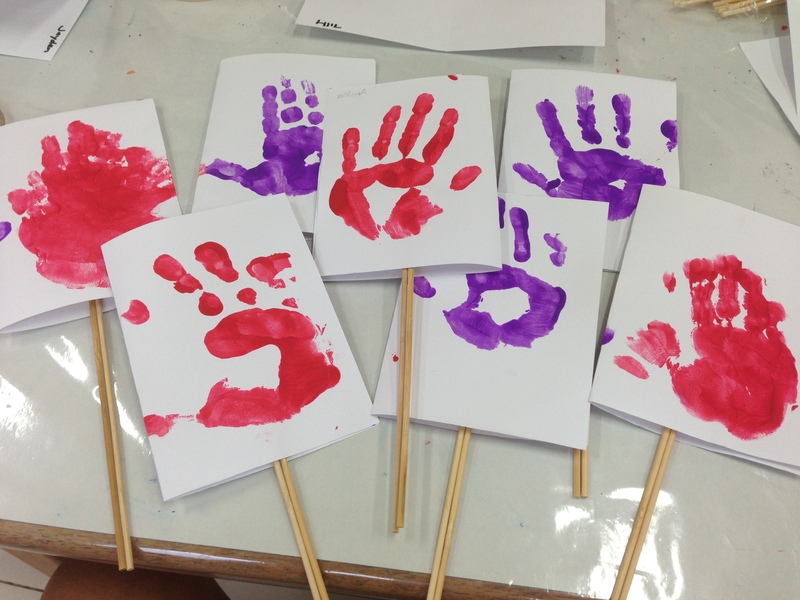 After the paint dried, we attached the handprints on the bamboo sticks and then placed it in the soil. 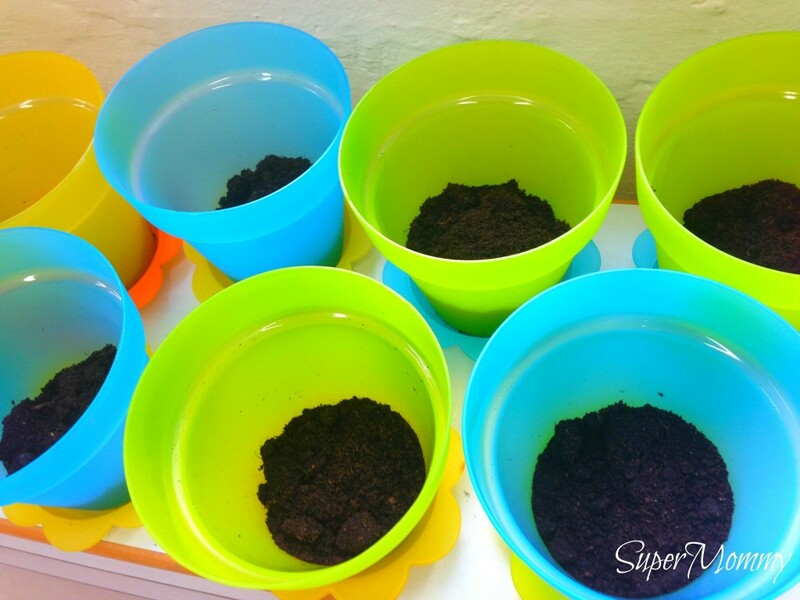 The kids then planted the seeds and more soil was placed inside. The kids got to take their “Flowers for Mom” home on the Friday before Mother’s Day (and yes they were all very excited)! Even though the seeds were planted on Thursday, just two days later on Saturday morning I already noticed two of the seeds sprouting! Now we just keep watering it daily and are watching to see Mommy’s flowers grow. I will add an updated picture once the pretty flowers bloom. 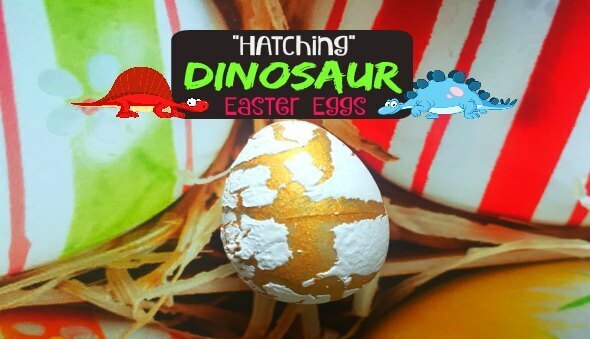 Even though this is technically a “Mother’s Day” gift, it also make a fun Mother & child activity to do together to celebrate the special day. Try to plant the seeds well in advance of Mother’s Day. If you don’t have time to pre-plant the seeds, don’t fret, the pot of mud is still really cute on its own. 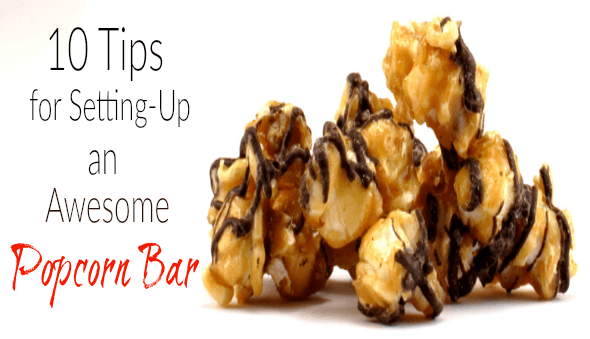 Make sure you buy seeds that will grow indoors and in the shade. Buy quick growing flowers. These sunflowers were the fastest growing flower seeds at the nursery and it will still take approximately 60 days to show flowers. 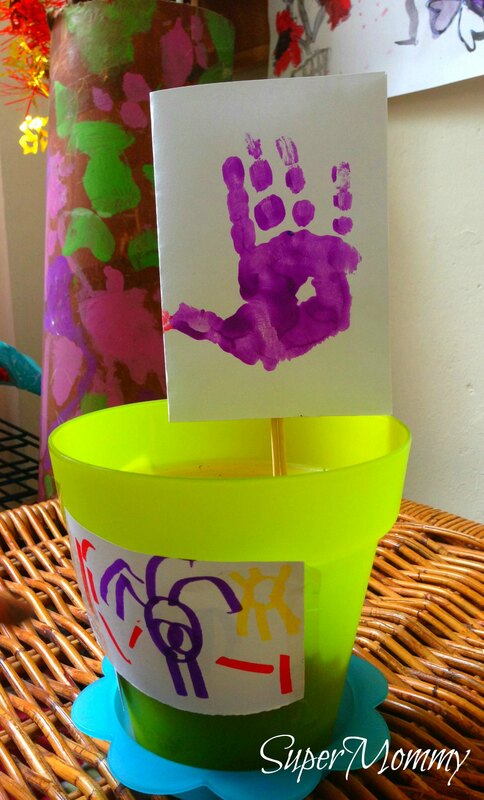 A flower pot also makes a great gift for dads and grandparents. 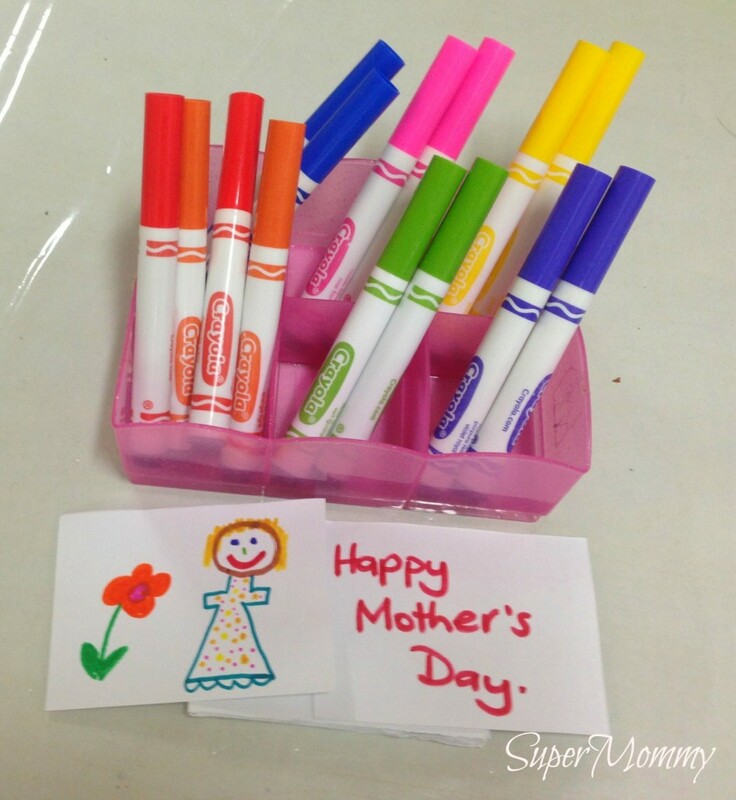 Hope you have a very Happy Mother’s Day!